Understanding customer transactional behaviour pays well for any business. With the tsunami of start ups in recent times and the immense money flow in businesses, customers find lucrative offers from companies for acquisition, retention & referrals strategies. Understanding transactional behaviour of a customer has become even more complex with the invent of new business houses everyday. Although, with the rise of powerful machines, one can easily manage working with TBs of data, complexity of business economics has made this behavioural analysis far more difficult. What is the actual value of a new customer in Dollars worth today? How much money business can spend to acquire a new customer? Lets take an example to understand it more intuitively. Firstly, to estimate the value of a new customer, we have to know the annual profit patterns or cash flow patterns if cash flow pattern differs from profit pattern from a customer. Secondly, we need to figure out how many years customer stay with your business? The figure above shows a customer profits for an imaginary firm based on all factors mentioned earlier. Customer value keeps on increasing with the time for which customer stays with the company. 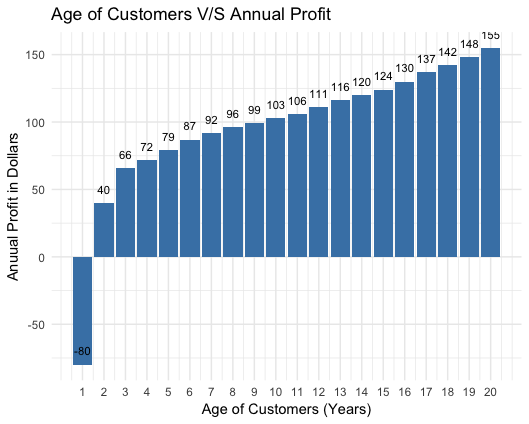 Customer who stays 2 yrs will generate $26 of profit ($80 acquisition cost balanced in first 3 years profits $40 & $66. 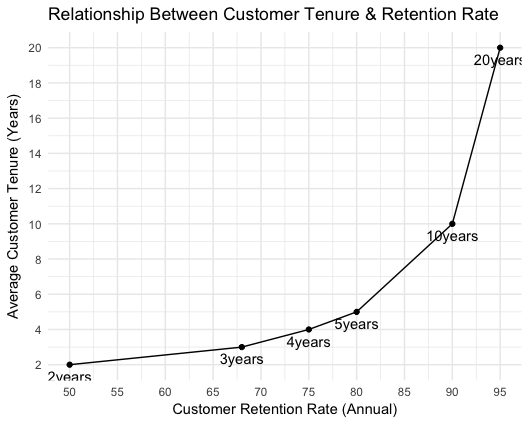 If customer stays for 5 years, will generate $264 in total (-$80+$40+$66+$72+$79+$87). But the differences in customer value is very large. For same calculations if done for 10 years, customers will generate net worth $760. It would not be wise to spend $760 today for a customer who will stay with company for 10 years as the profit generated in future would not be equivalent to $760 today. We need to apply discount computing to take it to present value. Using a standard 15 percent discount rate will make $760 to $304. (To get net present value of first year profit, therefore divide $40 by 1.15, for next year divide $66 by 1.15 and so on). So For a customer who will stay with company for 10 years, one can pay up to $304 on acquisition costs. Now we know how to calculate value of customer based on life expectancy of customer. The next question is what is expected duration of a customer to stay with company. To answer this, we have to find out retention rates for a customer. It is a fact that retention rates vary among customers based on age, profession, gender, acquisition source & may be more than dozen variables. 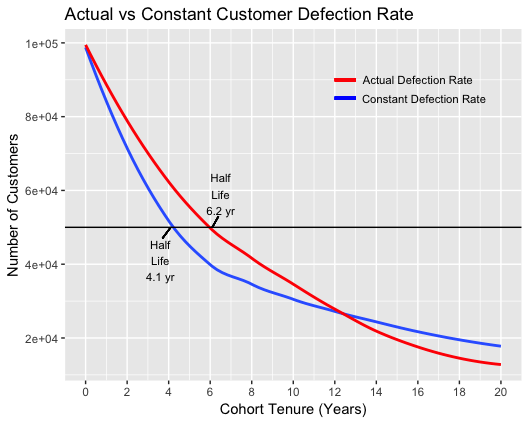 Simplest way to calculate average customer stay time is to calculate overall defection rate and invert the fraction. First count the number of customers who defect over a period of several months, then annualise this number to get a fraction of customer base to begin with. e.g. you lose 50 customer out of 1000 customer over three months. This works to 200 customer a year, or 1/5 of all customers. Then we need to invert this number, it will become 5. So now we can say, on an average, a customer stays with company for 5 years. In percentage terms defection rate for customer is 20%. To estimate customer cash flow accurately, we need to refine the above mentioned calculations. Firstly, we have assumed defection rates are constant throughout the customer life cycles. In real life, such is never the case; defection rates are very much higher than average in early years and much more lower later on. Taking averages may lead to over or under estimating the profit numbers. Additionally one more refinement we need to make to calculate the true value of customer. Instead of trying to calculate the value of single, average, static customer at a single moment, we need to think in terms of annual classes of customers at different point in their life cycle. In real world, company acquire new users each year. some of them defect early, others may stay for years. But company invest money in the entire set of customers. So, to get the present value of average customer, we must study each group separately over time. Lets take a scenario as shown in above image, where 100,000 new customers enter at time zero. Company invested $80 at time zero making it to total $80*100,000= $8 million for whole set of customers. By end of year 1, 22% customers defected, only 78% left, to pay back invested 8 million. By year 5, more than half people defected. To get present value of customer, we will estimate the set of cash flow people generate till the time they defect. Earlier in blog, we get current value of customer at $304. At constant rate of defection of 10%, we may be dangerously wrong in deciding the money to be invested in customer acquisition whereas the actual defection rate shown in above image make this number to only $ 172 from $304. Imagine company spending $200 on new customer based on earlier calculated values. It would be completely lose making venture. In above calculations, we tried to approximate the customer life time value & corrected ourselves initially from $ 760 to $172. It still contains assumptions of same cohort transactional behaviour. Every individual behave in a distinct way. When we plan targeting a customer based on machine learning based marketing campaign then why not to calculate Customer life time value for every unique customer. Based on certain pre-defined variables, one can easily predict life time value of a customer & can strategise accordingly. One can also add that every organisation is getting more and more transactional data every day making it difficult to manage especially, in the presence of numerous acquisition dependent variables, to get the accurate accounting numbers. Moreover, the transactional behaviour of customers have also been largely influenced by various offers, incentives from cash burning start ups. By making use of RFM ( Recency-Frequency-Monetary)- “magical marketing triangle” with advanced statistical methods considering customer irregular transactional behaviour, can help in creating a probabilistic machine learning model to do wonders to business economic predictability.